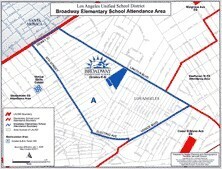 If you live within LAUSD, all you need to do is to pick up a permit from Broadway or your home school. The permit requires signatures from the principals of both schools. Since the Mandarin Immersion Program is not offered at your home school, you will be released and will be allowed to choose Broadway for this program. If you live outside of LAUSD's boundary, you will need to complete an online inter-district permit process, which is simple but takes a little longer. Use the following link to access the inter-district permit information. For information about Broadway's attendance boundary, click the map icon below.